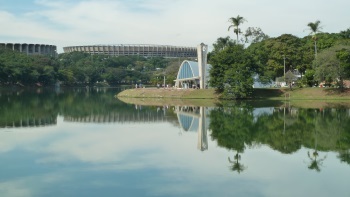 Pampulha Modern Ensemble is a fine example of Brazilian modern architecture, built as a Garden City around an artificial lake. This neighbourhood of Belo Horizonte was designed from 1940 on by architect Oscar Niemeyer and landscape designer Roberto Burle Marx. The ensemble included a casino, a restaurant/dance hall, a yacht club, a golf club and a church. The buildings are among Niemeyer’s earliest works, and show his talent to adapt 20th century modernism to Brazilian surroundings. I really hope this site makes it onto the world heritage list. It is an impressive and influential piece of urban planning, but it is elevated to being outstanding by the magnificent church of São Francisco. Pamphula is an affluent planned suburb in northern Belo Horizonte, set around a man made lake. The usual array of Brazilian modernist architects, artists and designers were involved with the main buildings coming from Oscar Niemeyer. There are some really quite impressive buildings circling the lake, a forum discussion a few years ago first drew my attention to the Yacht Club. I was instantly drawn to this beautiful piece of modern design. In the intervening years I have grown to realise that this mid century modernism is actually my real architectural sweet spot, and it has enhanced many of my trips, and even my life in London. On a glorious Saturday morning we joined many of the locals in making the lake shore the basis of our leisure activities. First stop was the recently restored Casa Juliano Kubitzek, built for the then regional governor, future president and long time patron of Oscar Niemeyer. It turns out this was an excellent place to start, not just because it is a beautiful house, but also because it's home to a small museum that explains and contextualises the whole area and the relationship Kubitzek had with a generation of modernist artists. From here it was a pleasant stroll to the church of São Francisco. This small church could comfortably be a World Heritage Site in in its own right, architecturally innovative (the first use of concrete parabolas) but even more important are the astounding ceramic decorations inside. I had seen images of them before and not been that interested, however the reality ranks as one of the finest churches I have ever been in. There was just something so emotive about this exceptional artwork, it left us reeling, not unlike when we left the Scrovegni chapel. After this we carried on our anti clockwise loop. It took us past the Minero football stadium, site of the previous year’s memorable World Cup semi-final, a tournament that rather cemented our desire to visit Brazil. A little further on we sadly discovered the yacht club, which had originally piqued my interest, was hidden behind a high wall. But a little further on the Casa do Baile proved to be really enjoyable. The curving architectural forms were a perfect setting for the contemporary art on show, but even nicer was the stand from the local Küd microbrewery which attracted a really friendly crowd to their tasty output of English inspired beers. A taxi took us to the former casino on the opposite side of the lake, which was the most important building in the original establishment of Pampulha, it is now an art gallery and it was impressive. Though after two days in Brasilia and several hours touring modernist buildings we perhaps weren't in the right frame of mind to get the most out of another example, no matter how important. Feeling the need for new surroundings we jumped in a taxi and headed to the central market in Belo Horizonte, where we discovered one of the city's other great charms; its food! Feijoda and Pão de queijo are very much on my rotation as tasty treats to remind me of my travels. Pamphula was a really rewarding and exceptionally pleasant site to visit, as a modern urban landscape I think it could probably be justified as a WHS, however when the magnificent church of São Francisco is factored in it is elevated to a site well worth going out of your way to visit. Read more from Ian Cade here. Pampulha Architectural Ensemble is Brazil probably Brazil's next nomination for inscription in WHS list. Pampulha is the name of a upper-class suburb of Belo Horizonte city and was designed by Oscar Niemeyer, a famous architect (who died in 2012 at 104), also responsible for the construction of Brasilia (another WHS). The most famous elemento of Pampulha ensemble is Sao Francisco Church, a tiny temple by the lake shore, which is considered one of Niemeyer's early masterpieces and inspiration for many other buildings in the same style worldwide. I was there last weekend, in a sunny and relaxing Sunday afternoon. Should Pampulha be inscribed, Belo Horizonte is to become the closest Brazil will have to a WHS hotspot, also including the colonial cities of Congonhas, Ouro Preto and Diamantina.